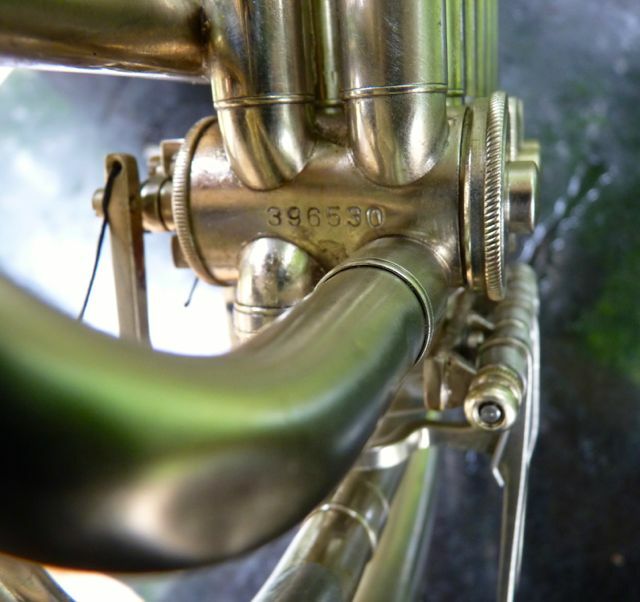 Holton’s escape from the H 376, a copy of the Sansone double horn where the Bb tuning slides lay on top of the F tuning slides, was to hire Phil Farkas to help them with a new design. In many ways it was very similar to the Reynolds horns which were very similar to a design by Kruspe. Odd, how a few “wraps” have almost become the standards for horn design. The first “Farkas designed horns were the Model 77. In this blog we’ll concern our selves with a NiSi version of this new design. 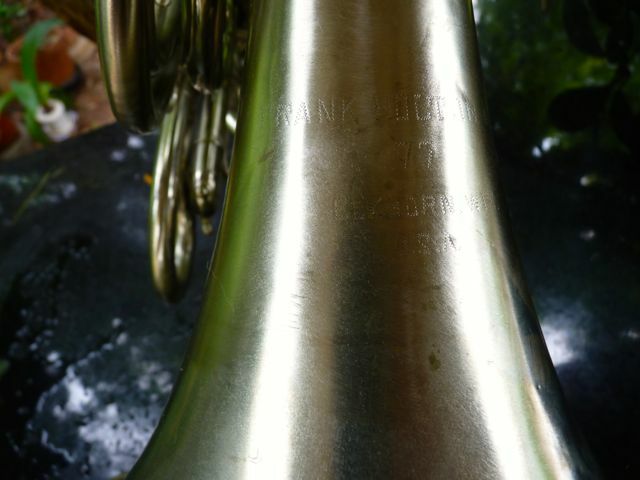 Based on the serial number this horn was produced in about 1965. 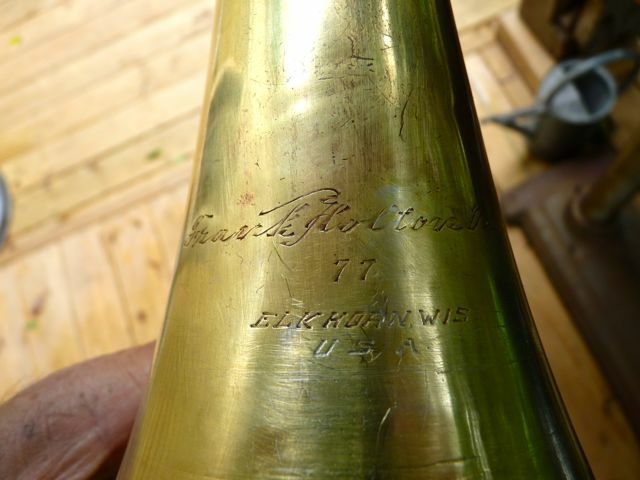 It is not one of the early 77’s which had hand engraved “Frank Holton, etc”the one shown below is c. 1962. The 77’s had foreign-made valves, I’ve been told made in Europe and are identified by the oil port on the top bearing plate. 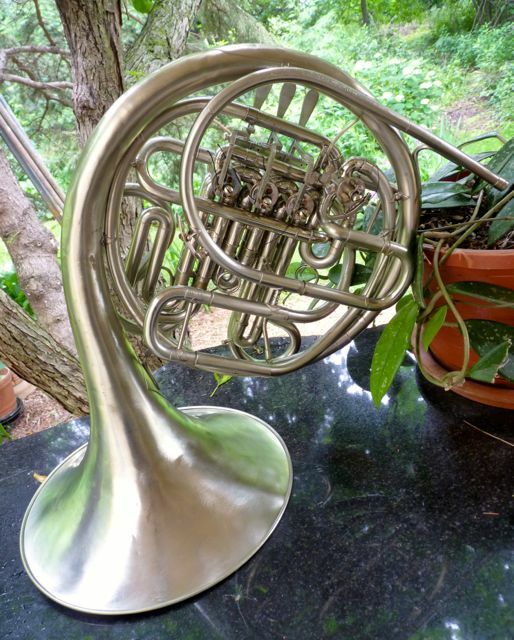 This horn was a basket case when acquired, (it still has scars and small dents). The valves had been plated, so I took a chance with it and spent some time on it. Having never been trained as a “buffer” nor having the dust extraction set up and a multiple step set of wheels, etc. in my small root cellar shop, I opted to do the finish on this “job” as a wire scratched finish. Generally I “hand Rag” the finish using wide woven cotton tape, using very fine abrasives (pumice stone) carried in oil and shoe shine polishing technique. The horn has no lacquer and will oxidize unless care is taken to retard the oxidation. However with the scratched finish, done with a wire wheel with a very fine .004″ diameter wire, it is not super shiny and an owner will not have to worry about the perfect Drum & Bugle Corps look. You could even de-oxidize/clean it using green “scrubbies”. The resultant look is not far removed from the old sand-blasted silver plated look from the early previous century. Once together, it plays well, with an exceptional high range and a good full low range. 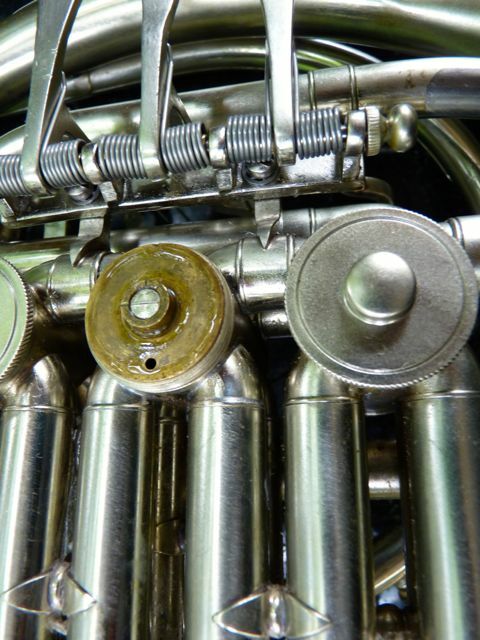 In-tune across the F/Bb horns. 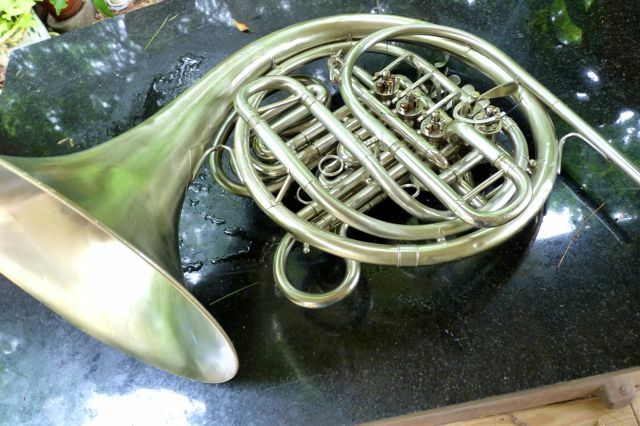 and would be a good horn for any re-emergent player or a double horn for a serious player who likes a NiSi horn. There are folks out there who know about 67.8 times more than I do about horns and Holton’s history. If they chime in with corrections I will post them to make this entry more accurate. 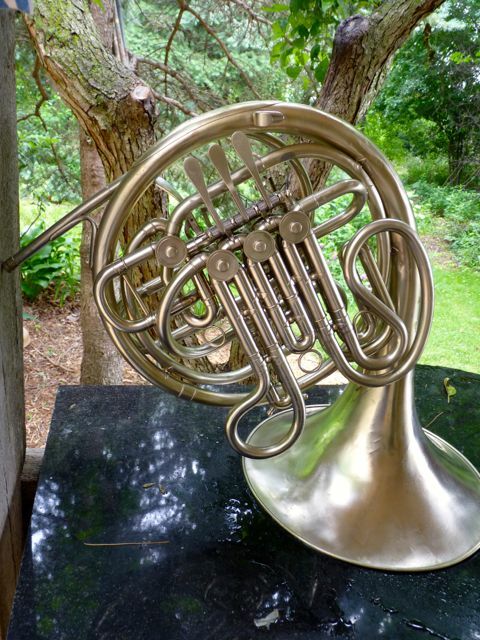 Thanks in advance….This horn is SOLD. I’ll not be in Ithaca due to work being done on our only bath, see pics. Where the tub was… Where the wall meets the old root cellar…..